The January 2010 Newsletter has been posted. Links to photo galleries and additional information mentioned in articles in this newsletter can also be found there, too. The first SNU lunch of 2010 will be at Cabela’s Saturday, January 23, 2010. Cabela’s is located at 8650 Boomtown Rd, Verdi NV off I-80 approx 10 miles west of Reno Each person will choose their own food from the buffet line and pay for their own meal. We’ll be in one of the meeting rooms behind the cafe. To RSVP: hq@sierranevadaairstreams.org or call 775 972 5011. Just off Hickison Summit off US 50 east of Austin is the BLM Petroglyphs campground. Here’s a tour. Hunker down, it’s a winter storm! They were forecasting a bit of snow Sunday night into Monday and it appears the forecasters were a bit conservative. Here’s what is looks like Monday morning. The Nevada Winter Road Conditions website at Safe Travel (also 511 or 877 687 6237) has chain or snow tire conditions on I80 nearly all the way across Nevada, on US 50 out past Austin, from Gerlach to Hawthorn and even on the US 70 Feather River route as well as all the usual routes in the Reno and Carson City area. So, if you are thinking of travel in Northern Nevada this week, forget it. Find someplace you can hunker down and wait for the storm to break and the road crews to clean up the mess and the weather to abate a bit. Do make sure to find someplace to hunker down where you can keep warm as this storm appears to be bringing January and February temperatures with it. In weather like this, road travel is hazardous and even just keeping warm and safe can be an issue. Take care. The area is just south of the Weeks Bridge and Buckland Station a few miles south on US 95 from Silver Springs on the Pony Express Trail. 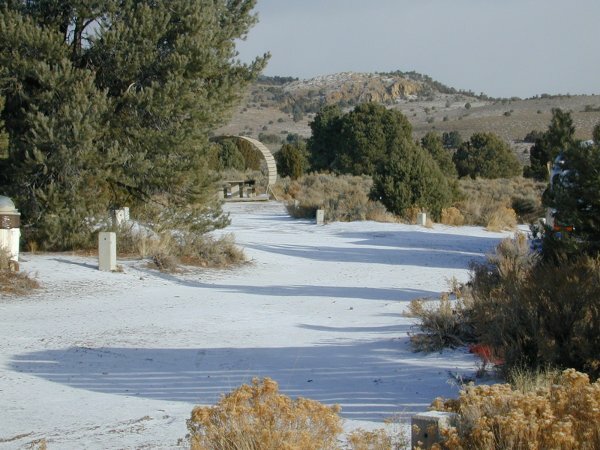 Scout Camp is a part of the Carson River Ranches area of Fort Churchill State Park. Nevada now has quite a section of river front from Fort Churchill to Lahontan. There are trails along the river and canoe access for day float trips. Scout camp has a privy and horse corals as well as a dozen or so campsites. The area is on the riverbank and serves as a flood plain for the Carson River. What made an impression on this campout was the abuse of the campground. See the Carson River Ranches photo gallery for a contrast and comparison. In the earlier gallery with pictures taken in September there were road trails winding in a loop past the campsites. 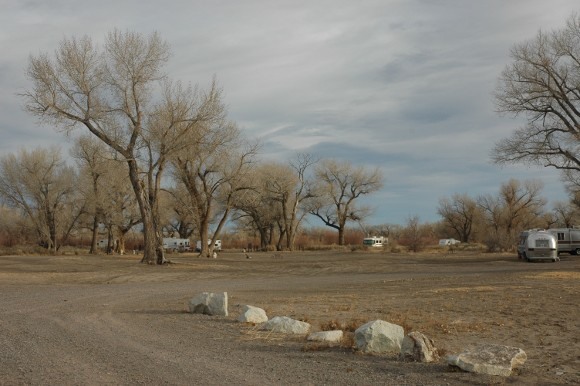 In this photo gallery, taken in November, major sections of the campground were just large packed dirt areas with no discernable difference between vehicle trails and other areas. Even in fall, the area, as a flood plain, should have dried grasses trapping leaves from the trees to reduce erosion and improve the quality of the soil. The denuded areas are vulnerable to floods that might occur next spring. This is an abused campground and it is going to take a while for it to recover. There were toyhaulers enjoying the desert for Thanksgiving as well. These campers turned south on the powerline away from the river to enjoy their ATV’s, firecrackers, and target practice. That must be BLM area adjacent to the Nevada State Parks land. Camping should be free there if that is the case but the $10 per night at Scout Camp does provide for free dumping at Fort Churchill or Lahontan State Parks. It’s a bit of a drive south but the scenery is terrific and the weather is nice this time of year. 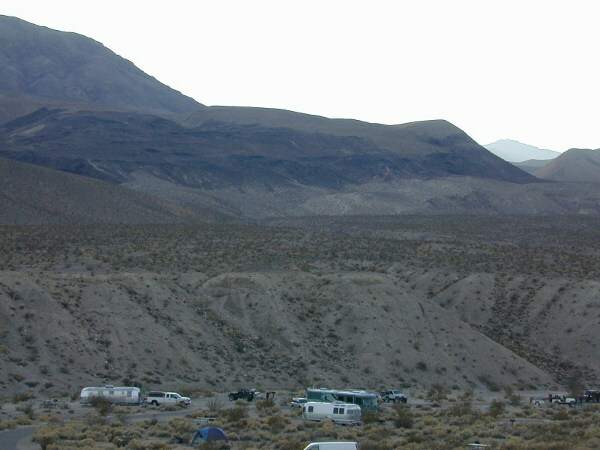 See the Death Valley National Park, Mesquite Campground photo gallery! There’s even a picture of Anita’s new pet! (see picture 5). She had to leave it, though, as Ebert (the parakeet) and Indie (the cat) weren’t receptive to sharing the Airstream.